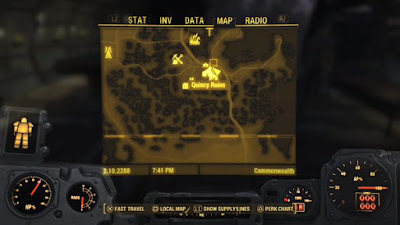 The Quincy Ruins are located in the far southeast of the Commonwealth. It’s pretty much the last large concentration of buildings you’ll find before you hit the southeast edge of the map, barring a trip out into open waters. Quincy is in some dangerous territory, sandwiched between concentrations of Super Mutants and Raiders, so you’d best be ready for a scrap. Low-level players need not apply. Take the town one section at a time. Wipe out every Gunner nearby before roaming around. Despite their numbers they don’t move around that much, and often don’t notice that you’re there, possibly because the buildings are so densely-packed. Stay out of the open. This is a wise strategy under most circumstances, but it’s especially smart for Quincy because you will be targeted from afar by Gunners up on the highway if / when they get a bead on you. If you need to enter the open, leave it again quickly. That said, it’s not a bad idea to enter the open occasionally just to goad Baker into uselessly firing his Mini Nukes. Eventually he’ll run out and basically be another grunt. Quincy is densely-packed, making sniping difficult, but the aforementioned highway makes for a great place to get the job done. You can get up there via wooden stairs in the northeast of Quincy. Most of the Gunners aren’t wearing helmets. This includes Clint, the otherwise steel-clad Power Armor user. Aim for the heads for quicker kills, and their armour in general is preeeetty thick. The stealth approach is very effective in Quincy, as Sneak Attacks can OHKO most of the Gunners and you can find plenty of places to hide if you get caught. Just try not to get caught, or you’ll be in for some pain. Look for side entrances rather than strolling in via the front door. Tessa has Tessa’s Fist, along with the pieces of her Power Armor. Baker is carrying Tessa’s Holotape, as well as a Fat Man (and a really awesome set of Heavy Combat Armor). Clint has Good Intentions. (Yes, it’s a weapon.) He also has the parts of his Power Armor, along with bits of the Minutemen costume. If you approach Quincy at night and under cover of stealth you may find him out of his Power Armor, leaving it ripe for the stealing. There’s a stalled train in the north of Quincy, beneath the highway. The inside is rigged with a Missile Launcher trap. On the plus side, if you survive, free Missile Launcher in the control booth! In roughly the middle of Quincy you’ll find the remains of a store with Weapons and Armor Workbenches. If you hack the terminal here you can open a nearby floor safe. In the same building as the store you’ll find several apartments. One has a balcony, and on the balcony is a container labelled ‘Mama Murphy’s Stash’. What does it contain? Drugs, obviously! Lots of glorious drugs! Inside her apartment you can find Mama Murphy’s Note under the dresser beside the bed. Across the street from the apartment is a pharmacy, inside which is a terminal belonging to another familiar face. In the rear of the pharmacy is a safe full of ammo and valuables. In the southwest of Quincy, on the outskirts of town, is an underground parking structure attached to a boarded-up Super Duper Mart. You’ll find Radscorpions living on the ramps below, and at the end of the road you’ll find an Expert locked steamer trunk full of goodies, along with some Pre-War Money. Across the street from the Super Duper Mart is a pharmacy. There’s a small sleeping area up on the highway. You can find a cart near the beds that’s laden down with chems, including an impressive number of Stimpaks. On the top level of the highway, between two transport trucks, you can find a terminal. It contains more details on Quincy’s downfall. Beside it is a copy of Guns and Bullets.